The Lounge range by RAK is a premium quality full bodied porcelain wall and floor tile available in matt or polished finishes. Within the range are 5 colours, a deep anthracite\black, two greys, beige and the stunning ivory. All of these colours are available in a choice of two large format sizes, 600x300mm and 600x600mm. These large format floor tiles are amazingly hard wearing, and have a subtle mottled stone effect within the finish. This finish means that even the high gloss polished versions of these tiles wont drive you mad keeping them clean; unlike plain high gloss black, white coloured floor tiles that show every smear and mark. 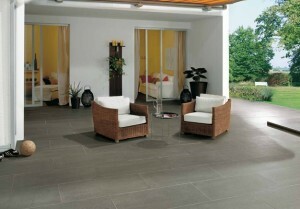 This range of large porcelain tiles can be used internally and externally in a domestic or commercial setting. Equally suited to use on the wall or the floor these really are the most versatile tiles around. Polished porcelain stone effect tiles are very popular and the Lounge range is one our biggest sellers due to the high quality and low prices. You can cut these tiles easily with a good quality manual scribe and break cutter, and as they are pre-sealed porcelain they don't require sealing. Clean these tiles with a micro-fibre mop and use Lithofin easy care for a smear free finish.